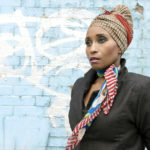 Malika Booker is a British poet of Guyanese and Grenadian Parentage. Breadfruit (pamphlet), (flippedeye, 2007) received a Poetry Society recommendation and her poetry collection Pepper Seed (Peepal Tree Press, 2013) was longlisted for the OCM Bocas prize and shortlisted for the Seamus Heaney Centre prize for first full collection (2014). She is published with the Poets Sharon Olds and Warsan Shire in The Penguin Modern Poet Series 3:Your Family: Your Body (2017). Malika has been the recipient of residencies from Millay Colony, Cove Park, The India International Centre and Kocevje through The Centre for Slovenian Literature. She is a Fellow of both The Complete Works and Cave Canem and was inaugural Poet in Residence at the Royal Shakespeare Company. Malika has an MA in Creative and Life Writing from Goldsmiths University, was the Douglas Caster Cultural Fellow in Creative Writing at University of Leeds and is currently a poetry Lecturer at Manchester Metropolitan University. If you did see people that first night. People for so. Who come from town, from far like St David, from near like St Mark to this little St John parish. It had the makings of a good funeral. Pure bus park up by Gouyave roadside like ants. Them mourners arrived, shuffling with the shock. The priest opened up that wake with plenty prayers. Corn soup bubbled in the iron pot, red beans slowly converged with rice, thyme and coconut milk. Chairs clustered like fowls in the yard. Till he mother fell down under the weight of her dead son. So young she muttered so young. Grief song is a different story. A clap of hands then a rocking back and forth story. Grief song is a body dancing to a jagged melody story. Grief song is so searing, it’s the belly drops to knees story. Grief song is the way his mother sinks into the arms of Rock of Ages story. I tell you Grief song is a hard to tell story. Martha had dreams for so since the night he dead. And wise woman Clarise could not make head nor tail of flying fish and hummingbirds over rough river water. Of eddo swelling under rocky soil. Of septic tank full of bleach and blue soap. What does it mean she muttered what does it mean? To hear his name called dry so on radio – was the son of… brother of… left behind, bruck her up. And them doltish dogs howling a relentless dirge for they master who never pelt them with kick, who boil one fresh pot of dog food; chicken neck with gravy and white rice, every morning like greeting. Them dogs howl so till grief lock off they windpipe. When Lazarus fas up and step cross the threshold of he own wake, rank with corpse stink, the wake bruck up. Who put foot out of door quick time. Who start pray fast fast. Who faint and get revive with smelling salts. Miss Gibbs forget she hips bad, till she tek two steps and fall Bra-tap. Mr Power start moan bout the good good money he dash way on pretty funeral frock for Betty and now she can’t even use it. Uncle Johnny start fling rum shouting You dead man, you dead! like libation have any power over the resurrected. It had the makings of a boss funeral, mourners muttered, sulking into wake’s shadow. Martha steups over and over like chant, her venomous kiss teeth terrifying even tough back crapo. Mary vex too bad, How he could go and make their serious work of grief into a pappy show. Mary head get hot – Look how much white candle he mother burn to light he way and how like stubborn jackass he refuse to follow instruction, Just turn away from the light boldface so. This was just like when he was hard ears to leave he mother womb. The old choir women in the back room stop singing and only cussing bad word, wild at the shame and slander of this thing. Lazarus dash way hymns and cuss words from he house with the heavy bass of a thumping speaker box. The floor boards start tremble, as he foot rise up and skip, as he fingers lick and clap, when the Rasta man chant take over. Give thanks. Lazarus dance fire and brimstone. Dance chant down Babylon. Start lick fist on fragile board wall. Start shout more fire, more fire as if alive scatter springs into he steps; as if alive shake up he mind. He locs swinging like thick twine tied to air and he chanting i&i livity, i&i livity. And when that reporter woman ask Lazarus what it was like, as they sat in the cream-wall room with the hum of mosquitoes and he say, there is a chart to being resurrected. An atlas that have mud swamp, sweet water river and thorny paths. There is a one foot in front of another chart. A believe and it shall be chart. A surrender chart. A rhythm chant chart. And you just have to trod it all rude girl, you just have to trod it. And when they saw he still lived to this ninth day, they cancelled La Qua funeral parlour, grab he up in a white sheet, tote him swinging like he in a rocking hammock to the sea shore and roll him in the coarse hot sand. Then dunk he head in the salty sea, washing death’s stench off of him. Then they anointed him – all palms seeking to touch their feeble miracle.